Home / News / EHF / EHF EURO 2012: Germany without Kraus in Serbia! After William Accambray, the second “big name”, playmaker of German NT, Michael Kraus won’t be able to play for his team at the EHF EURO 2012 in Serbia next month. After crash-accident last summer, when he was injured (knee), playmaker of HSV Hamburg was out for almost four months. He is still far away from ideal form, not ready for hard preparation and tournament where Germany is looking for the “last train” for Olympic Games qualifications. 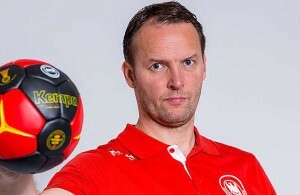 – We found conclusion together that after four months break and just a few games, such a big load as EHF EURO 2012 for Mimi coming to early – said Heiner Brandt successor, Martin Heuberger. Germany will play at Preliminary Group in Nis with Macedonia, Sweden and Czech Republic. ← Previous Story WCh in Brasil 2011: Norway against France for the Gold! Next Story → World C’ship (W) Final: Norway or France?